November 6, 2012 – My first flight leaves from Victoria (YYJ) at 11AM to Vancouver aboard an Air Canada Jazz Dash 8 turboprop aircraft. This is a standard aircraft used for these short haul flights, which typically take about 20 minutes. My next flight leaves Vancouver at 1PM to San Francisco, so I don’t have much time to find my gate. I get lost in this rat’s maze – I never would have found the tiny door everyone flying to the USA has to go through without some help from a policeman. I have a few minutes to grab a sandwich from Tim Horton’s for lunch, since there are no meals served or available on this fully booked United Airbus A319 – a small regional jet. We depart on time and arrive a few minutes early in San Francisco (SFO) at 3:30PM. I easily find the gate for my next flight this time. 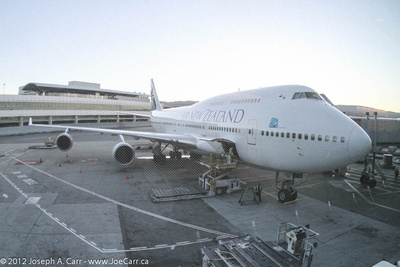 Now I wait three hours for the Air New Zealand Boeing 747-400 flight to Auckland to depart. There is free Internet available – way to go SFO…land of the geeks, so I feel right at home! The young man at the podium checks me in, and assures me they will be serving both dinner and breakfast, as well as a mid-flight snack, so I should be well-fed! I can see the flight is going to be late departing as the huge waiting lounge fills up with passengers. This flight is mostly full, so there are over 300 passengers to deal with. There are seven groups for embarkation, and guess which group I’m in? The last one – #7. The flight departs almost an hour late. It seems to take forever to get people to sit down so the doors can be closed. Once that happens, there are yet more delays once we pull away from the gate. We sit there on the apron just off the gate before we finally start taxiing to the runway. It takes a full 20 minutes to reach the button before we takeoff. I’m relieved when we are in the air and on our way, although at the same time I’m dreading sitting in the same airline seat for some 13 hours. I have a window seat, however since the flight is at night, this doesn’t do me much good. Air New Zealand provides very good service during the long flight: a lovely dinner after we are a couple of hours out of SFO complete with complimentary wine and drinks. There are well over 300 passengers with few seats for us to stretch out on this fairly full flight, so I don’t sleep much on the long flight. In the early hours I have a look outside to view the southern sky stars, and later on, the Milky Way comes into view straight up and down just off the wing tip. The flight grinds on. We are served breakfast about 3 hours before our arrival in Auckland (AKL). They leave the lights on at this stage. I suppose the crew want to encourage the passengers to get all their fussing about done before arrival, so the deplaning process will happen smoothly. To my great relief, the deplaning process does indeed proceed quickly. I still have another two-hour flight to Fiji before my journey is complete. This is another Air New Zealand flight aboard an Airbus A320. Departure time is stated as 6:05AM, so needless to say I’m worried I won’t make the connection due to our late arrival from San Francisco at 5:30AM. After disembarking the aircraft quickly, finding the gate in short order, and after talking with the check-in clerk, I can relax. The flight crew only arrives at the stated departure time, and the flight leaves almost an hour late. I guess the crew are operating on “Fiji time”! Of course, it doesn’t matter to me if we arrive late in Nadi, since this is the last segment of my long journey, and I have nothing planned after arrival except getting some sleep as soon as possible. The Air New Zealand flight to Nadi is full, and takes the full two hours flight time to fly virtually due north of Auckland to Fiji. There is no time difference between Auckland and Fiji – both are in the first time zone on the other side of the International Date Line. Our landing at Nadi was “hard” in my books, although it wasn’t officially “hard”, since I doubt the pilots broke any undercarriage! It is a relief to get back on solid ground, and feel the warm tropical air hit my face as we leave the aircraft in Nadi and walk along the open air ramps to the main terminal building. My checked bag arrives none the worse for wear; I clear Fijian customs and immigration in a few minutes; hit the bank machine for some Fijian Dollars; and I’m off in a taxi for the half hour drive to Lautoka and First Landing Beach Resort and Villas, arriving a bit after Noon. My flights to Fiji from my home on the west coast of Canada entailed an end to end duration of some 26 hours going to Fiji, so I will be ready for some down time upon my arrival in Nadi, Fiji. I have arranged to arrive a couple of days before the Solar Eclipse Cruise leaves, so I can relax at a resort nearby to Lautoka, the departure port for the Paul Gauguin cruise ship. The return trip home isn’t much better, with a duration of some 24 hours end to end. This is the price to pay for experiencing paradise – and a total solar eclipse observed from a luxury cruise ship sailing in warm South Pacific waters! When I first booked my flights to Fiji about six months before departure, total elapsed time (from Canada to Fiji) was about 19 hours. After Skywest (United Express) cancelled my flight on the first leg of the journey from Victoria to San Francisco, I was automatically rebooked, and the elapsed time zoomed up to about 28 hours. I called my travel agent to complain, and they found another routing through Vancouver which reduced the flight time to 26 hours end to end, despite adding a stop. I spent many hours are spent in airport waiting lounges. The airlines obviously want fewer flights which are more fully-booked. This entry was posted in California, Canada, Fiji, New Zealand and tagged airline. Bookmark the permalink.